It’s well known by now that I’m a Google freak. I like what they have done with things like Gmail, Voice, and I’m always looking for more. I just discovered a pretty cool feature within Google Docs as I was updating a shared spreadsheet. It’s something anyone can use and maybe of interest to blog writers and domain developers. 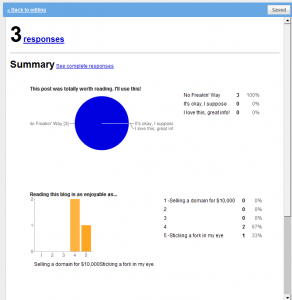 It allows you to create a poll for your website or blog. It’s simple to use and easily captures results. You can use a plain version like I have here or you can add one of 95 themes to it. Here’s what it looks like. If you’re interested in how to set it up, here are the quick and easy steps. 1. 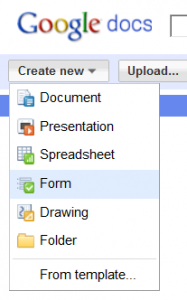 Select “Form” from the Google Docs “Create New” drop down menu. 2. 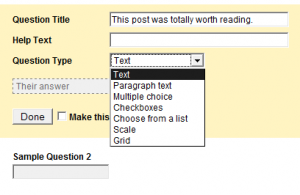 Next, fill out the questions and select the type of response you’ll allow. 3. Click “More Actions” and “Embed”. Just paste the code on your site or blog and it’s that easy. I haven’t done any polls on this blog in the past, but I can certainly see how useful this can be. Not only on a blog, but any developed website could use this code to get a better view of the users. Let me know how you use it if you choose to. My web design company is sort of morphing into the domain arena as I move more and more into domain investment and development. I’m not taking on new clients at the moment, so this post isn’t a self promotion piece, I promise. The name of my company is Infinite Designs, Inc. and I have been using the domain, InfiniteD.com for years. I chose that domain back in the 90’s because InfiniteDesigns.com wasn’t available when I started the business. I’ve since purchase the domain InfiniteDesigns.com for $300. The person I bought it from had an interior decorating company by the same name and is no longer operating it. She had paid $1,000 to acquire it from the prior owner. Recently, I began receiving typo emails for a domain similar to InfiniteD.com, but missing a vowel. I don’t want to mention the exact domain because I’m not looking to embarrass anyone. As I looked into it, I found the company that the emails were intended for. It’s a new company starting up and their website was under construction at the time. I emailed them and let them know I was receiving email intended for their employees at my address. I explained the business I was in (similar to theirs in that they also offer web design services) and that I would be willing to sell the domain to them. They didn’t bite on the idea. Instead, they built their business on a similar domain that could be considered a typo of mine. Oddly, the domain ultimately points to the dot biz version. It’s not a pretty domain by any means. In fact, for a web designer to be basing their work on this bad domain name should trigger questions in potential customers minds. If they had taken my offer, they would likely inherit any advertising and word of mouth publicity that I had already produced. I expect that instead, I will be reaping the benefits of any advertising and promotion they do. The funniest part is that some of the misguided emails I have received actually came from within the company. If the employees of the company are making that error, don’t you think the customers will too? When you are the end user of a domain, you might decide to develop it or to redirect it to an existing website. Even if you plan to develop the domain, you can make good use of it during the development process by forwarding any traffic the domain receives to your current site. Another good example of redirecting is also used for misspellings. Google has its bases covered with common misspellings. Googel.com redirects to Google.com. There are several types of redirects and several ways to achieve them. The most common being the 301 redirect. This isn’t ground breaking news to any experienced domainers or developers, but worth a post none the less. The 301 redirect code indicates the permanent move of a page to a new address. It is also the only redirect fully understood by search engines when indexing a site. This makes it highly important when taking SEO into consideration. The 301 redirect can often be setup right in the cpanel of your hosting service as pictured below, if supported there. Otherwise, you can use different methods using code such as PHP or Java. You can also make the change in your htaccess file. Check out this page at WebConfs.com for further coding examples and a nice tool to check for the proper search engine friendly configuration of your redirect. There are also pay services available that offer to redirect your domain, but those are not necessary if your server is properly configured and the options above are available to you. You’ve seen similar posts on other sites, but here is the perspective from a web designer who has developed sites for others, and for his own business purposes. Me. Whether you’re a domainer looking to develop some of your best names, or a business owner look to launch or relaunch your existing business online, the thought of web design may have you a bit confused. I have identified what I have found to be the 5 crucial questions to ask of any web designer you are considering. Seems like a logical first step, but you would be amazed at the number of clients that have come to me from other designers and complain of the quality of their newly developed site. In many cases, they hired the designer without looking at their body of work. This happens as the result of someone referring a friend who “does this on the side.” There is nothing wrong with hiring a part time designer, we all have to start somewhere and it will be cheaper than an experienced designer. Just make sure they can do what you are asking and that you can get a look at other sites they have designed. 2. Can I contact some of your current and past clients? If the answer is “no”, move on. You want to know what you are getting into. Good web design isn’t cheap. What better way to find out about quality, responsiveness, skill, business accumen and customer service than to talk to those that have used the designer or firm already. If the designer is proud of their work, they will be happy to provide you with references. If the customer had a good experience, they’ll be happy to talk about it. Many designer firms outsource. This isn’t a bad thing or a good thing, but it is something you’ll want to know. If they outsource to offshore talent or have an offshore team, this may impact turn around time for changes or updates. If you know that you’ll require immediate responsiveness, you’ll want to discuss this with your designer to avoid any unnecessary stress down the line. I have had an offshore team for several years. I let my clients know up front that there will be a 48 hour window for any requested changes. If something urgent comes up, I either handle it myself or have an onshore colleague address it. 4. What type of SEO is included? Most web designers are not SEO experts. Design and optimization are two entirely different arts. Although they need to integrate, they come from different areas of specialization. You should expert your designer to include some of the SEO basics, but if your looking to dominate in key word searches, you’re going to need to invest in an SEO. Consider the web designer the builder of your virtual store or office. The SEO expert is your virtual advertising department, or at lease a portion of it. Your designer should have at least two SEO professionals to refer you to if you are interested. Any less than that and they are not networking well in their own industry. 5. Who owns the site? This may be the most important question you ask. If things don’t work out between you and the designer in the long run, you’ll want to know who owns the copyright to the design and coding of the site. Are you free to move the site and hire another designer or are you just licensing the site from the designer? Honestly, there is no reason you shouldn’t have complete ownership of the site. If you are considering a firm that insists on using some proprietary code, ecommerce or back end system, I suggest you move on to another designer that offers the same package but gives you the ownership rights. Most importantly, read the contract. Everything should be clearly outlined including the scope of the project, ownership, time line and payment terms. Question what you read and be sure you are comfortable before signing. The last web site that my company, Infinite Designs, Inc., redesigned in 2009 was for a company that sells brass fittings. Interestingly enough, the owner of the company understands the importance of a strong key word domain name. The top search for this industry is “Brass fittings”. So it made sense to acquire the domain. The name was already owned and to be honest, I don’t know if it was a domainer or a private individual as this process took place several years ago. Regardless, the owner of the brass fittings company was able to acquire the domain at a vary reasonable price (about $1,000). Bottom line is that website is located at BrassFittings.com and has significantly increased traffic to the site. I will try to gather the exact statistics and post an update once I have the information.